Oh my, what a cold week it was, phew! Things where quite interesting down here, low 40's and stayed like that for two days! The sea temps on the reef edge went from the mid 70's to 68 degrees...a huge drop and it hurt. Bait has been a struggle and when that happens we know we are in for a long day. No big deal though, we just had to work at it all that much harder and we DID and everything worked out great. The only bait we had most of the week was live ballyhoo, great bait but our tactics had to be modified just a bit. When the temps drop this much the reef and bottom fishing becomes near impossible, the fish just don't want to eat so we never even tried. However, by the middle of this week everything will be different and it should get VERY GOOD. Looking forward to it!! The Sailfishing was slow, had to put your time in to produce 2 to 4 fish a day. The best we had going for us were the Mackerel. The down rod worked rather well with a double treble hook set up. In order to use the ballyhoos this was necessary. The rig of choice though turned out to be Gotcha lures. Cast them 20 yards or so, let them sink and wham...got 'em on! The fish were 6 to 8lbs, perfect size for the small lures, and using 12lb spinning tackle made things even better. Andrew and Chris also set up a few 20lb spinners with a 1/4oz lead in front of the short shot of wire and a stinger rig. This also worked very well, casting back 20 yards or so and letting the ballyhoo drift down and back naturally and wait for a bit. The winds were NW and the current was rolling pretty well to the SW most of the week which helped to stay on the fades really well. Hopefully we get some east winds the next day or two; this will help to warm the waters back up. Looking forward to an exciting week ahead. We have lots going on, ocean side and backcountry so stay tuned! 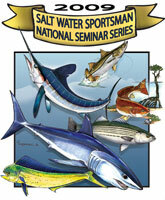 We’d like to thank everyone who attended George Poveromo’s Seminar in Jupiter, FL on Saturday. Looked like there were about 500 people there. This week Michelle & Thomas set up shop and were able to chat with numerous people who were interested in checking out our Keys & Bahamas fishing packages. Thanks to all who dropped by and we will be in touch soon! We'd also like to thank George & the co-host of this week's seminar, John Brownlee, the editor of the Salt Water Sportsman, for stopping by the booth and showing support. REALTIME REPORTS FOR EVERY FISHING TRIP! New Updates for Morehead City Giant Bluefin and Florida Keys Fishing! Take a listen and hear first hand what's biting! Over Under Videos - Click to Watch! 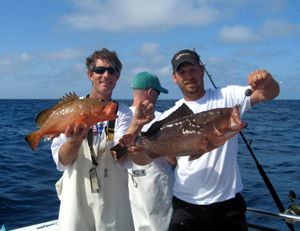 Pictured to Right - Nice Florida Keys Grouper! We started our day outside the Big 10 area at around 5:45 am. The water was not clean but we did not mark much bait there. We started working to the northeast just above the Big 10. We started marking bait and at 7:00 am the first bite reports came over the radio. We stayed with the bait readings we had, and were just 2.5 miles from the bite reports. Then right by us we had diving gannets, bait and crashing fish. We made a pass and did not get a bite out of it. We circled several times but no bite so we stayed with the bait for another hour. We then worked around the 10 fath line. A fleet had developed and several bites occurred until about 10:30 am, then things slowed down for the rest of the day. The hard bottom area SW of the Knuckle was holding bait all day as it seems the fish came in to feed at 7:00 and fed until 10:30 - 11:00. The rest of the day we spent time on the 10 fath line looking for bait, it was quiet. Not much to it for us today. We left the dock at 4:30 am and headed to the area SW of the Knuckle. We arrived just before 6:00am.We had our lines in and headed for where we had bait readings yesterday. Today we were fishing 2 Bally Hoo on our long riggers 450' and 500' back with Joe Shute 3oz heads. One planner bait 250' back, and a shot gun back 600' from a bridge rod (a friend of ours uses this with pretty good success). At 6:50am the first bite report came across the radio and we were right in the mix. When it starts you can't help to get an adrenaline rush. Everyone on board gets ready, the sleepiness goes away and someone got a bite right here! We checked the planner bait and got it to ride right near the bottom. Everything looks just right, Lil John and Phil's baits are swimming perfectly as we watched them go out. For the next 2.5 to 3 hours there are about 12 real tuna bites and a few grouper bites.We had bites within 150 feet of us as we pounded it out and it was not to be for us today. There was at least 75 boats when the fleet was at its largest and you could feel the clock ticking as the bite wound down, then it was over.We pushed our way out of the fleet and worked up on the shoal as we found thousands of diving gannets. When they rolled to dive they looked like a water fall. They were coming up with bunker each dive and leaving some floaters on top, not even eating them.We stayed there for more than an hour and didn't see any signs of or read any fish. Day six of no bites for the Pretty Work. It wears on you a bit. We pulled up the riggers and said "we'll get them tomorrow" and steamed home. 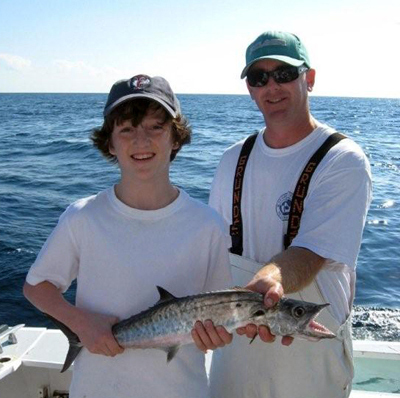 Bahamas fishing remains very good throughout the Bahamas chain. We are continuing to see an increasing amount of dolphin as every week progresses. This is very early for the dolphin to show themselves but we continue to see at least 4 or 5 dolphin bites per trip. There has also been a couple billfish , although not many, there seems to be a couple whites here and there. Wahoo fishing remains strong with the last passing cold front…. The strongest one of the season. Water temps are hovering around 73, 74 so we expect the fishing to remain consistent. Just got back in from a half day trip which was very successful. Although it was a bit slower we managed 6 bites in 3 hours of trolling. We quickly got into the action today boating one 25 lb dolphin and pulling the hook on another. We went an hour without a bite before we got bombarded by wahoo . Unfortunately we went 1-4 on them today as we got bit off on mono , missed two on the deep rod before boating one on a spinning rod. Yup , you heard that correct. I had some locals on the boat today who love to fish and he asked if he could put a 760 Penn spinner out and I said sure go for it . I trolled this from the bridge today with a feather and that was the only one to come tight out of the 4 hooked. After doing battle on the spinner for close to 15 minutes we boated our only wahoo of the day being 25 lbs. After trolling we decided to deep drop catching a bunch of yelloweyes , gueens and button snapper. Then we went to the reef to grab some yellowtails. We managed to catch a good bit of tails although the current wasn’t cooperating. The tails seemed to be hanging way out in the slick so getting your bait way back was the key. Finished a half day today where we did just this . 3 Types of fishing in a half day trip. Bottom fishing, deep dropping and trolling are all within footsteps of each other and all is possible in four hours. After catching some pelagic stop right there and deep drop for some tasty snapper then set you sights on the reef. Anchoring on the ref here is the key. I like to find the dark patches and anchor just in front for unlimited grouper and snapper fishing. The Out Islands remained hot this week as the wahoo and dolphin bite continued. There also seemed to be a bit of yellowfin around this week just off of Columbus Point in Cat Island. 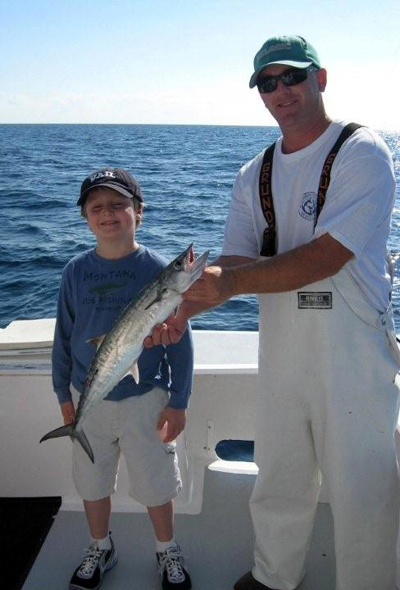 Cow Hunter was once again in on the action as they released a white marlin as well as catching their fill of dolphin , tuna and wahoo. 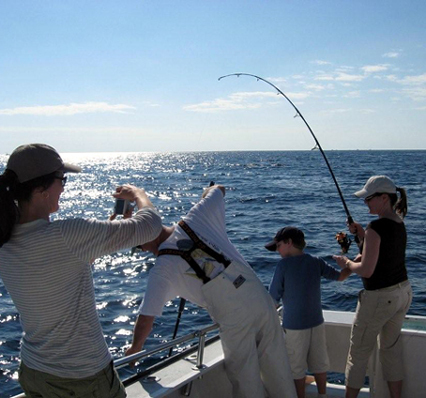 Fishing remains excellent throughout the Bahamas chain . On a daily basis we are seeing increasing amounts of dolphin as well as the wahoo fishing remaining some of the best we have seen. Nows the time to get over to the Bahamas while fishing remains HOT!!!! !